Display your love for dogs loud and proud with this puppy dog pendant! 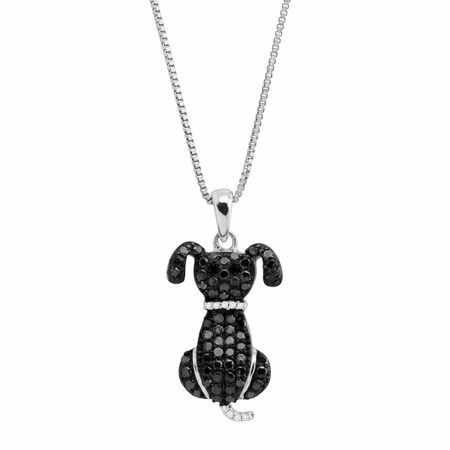 Round-cut black diamonds adorn a stylized form of an adorable dog, while round-cut white diamonds line its tail and collar for a total weight of 1/6 ct. Crafted in sterling silver, this pendant is a wonderful gift for a dog lover in your life! Piece measures 1 by 1/2 inches. Comes with a sterling silver 18-inch box chain with a lobster clasp.